GeeXboX, Windows Media Center Killer: Can you imagine that there is a full operating system the size of 8.87MB? In fact, it has a graphical user interface and specializes in playing multimedia files utilizing MPlayer. Also, did I mention that it has a Linux kernel inside? Indeed it is considered as one of the many Linux distributions, and its name is GeeXboX with the capital X's. 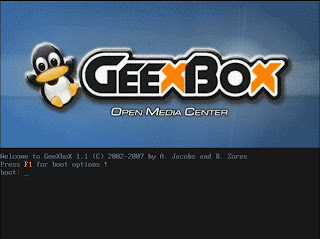 GeeXboX, as described from its website, is a free embedded Linux distribution which aims at turning your computer into a so called HTPC (Home Theater PC) or Media Center. Being a standalone LiveCD-based distribution, it's a ready to boot operating system than works on any Pentium-class x86 computer or PowerPC Macintosh, implying no software requirement. You can even use it on a diskless computer, the whole system being loaded in RAM. Despite his tiny ISO image size, the distribution comes with a complete and automatic hardware detection, not requiring any driver to be added. It supports playback of nearly any kind of audio/video and image files and all known codecs and containers are shipped in, allowing playing them through various physical supports, either being CD, DVD, HDD, LAN or Internet. GeeXboX also comes with a complete toolchain that allows developers adding easily extra packages and features but that might also be used to give birth to many dedicated embedded Linux systems. I downloaded GeeXboX 1.1 out of curiosity, and mainly because it is ranked among the top 50 in Distrowatch. You can download its latest version directly from here, and I promise that it won’t take long to completely finish the download. 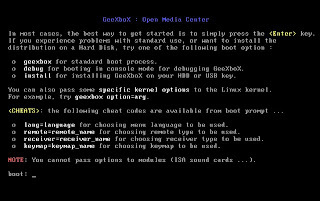 Anyway, so I got GeeXboX and then I tried and tested it using a Linux virtualization software. Once the ISO was loaded, a boot menu appeared, and I pressed F1 to try other options. I opted to boot using the “install” parameter, but it failed because it didn’t found my SCSI VM disk. Although the installation fell short, I’m still quite amazed by just knowing that it is possible to install it on a hard drive or to an external USB storage device. There is even a clear installation tutorial that can be found here. In a blink of an eye, I was taken to the GeeXboX’s plain and simple-looking desktop environment. The default desktop is very responsive as the system runs entirely on RAM. I also find it easy to use with its uncomplicated keyboard shortcuts for navigation. There’s a “help” option if you want some assistance or take a look at the useful commands, but I doubt if you will ever need it. 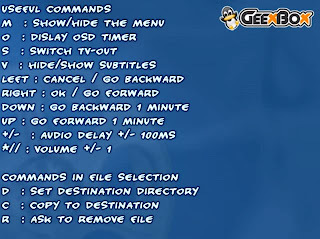 Plus, if you have a supported infrared remote control, you can control the desktop at the comfort of your own couch, thanks to GeeXboX's LIRC (Linux Infrared Remote Control) package. GeeXboX can successfully play variety of media files like DVD, DivX, MP3, MP4, AVI, MPEG, 3GP and a lot more (A screenshot of GeeXboX playing DivX video file shown below taken from GeeXboX website). There is also a TV-out option if you want to watch videos on the bigger television screen provided that you have an appropriate graphics card. It is said that GeeXboX also supports several TV tuner cards, Wi-fi cards, and it can even stream content through the internet. GeeXBoX is really worth a try, and I will recommend it to anyone who wants a quick, lightweight and easy-to-use Linux multimedia distribution. Bottom line, if you are a multimedia enthusiast but has a really old computer hardware, forget about the obscure and resource-hungry Windows Media Center operating system. Use this 8MB “wonder” Linux instead. Great review. Nice to know that there is a linux distro that is so tiny in size but yet so big in its ability. GeeXboX just shows off the efficiency and power of a Linux/unix kernel. Thanks for the review. Vm works if you pre-format and IDE disk... works like a charm. Also, you can also do a network boot if you have a TFTP server at home. Boots in no time and all PCs can watch movies without any problems!! Why would one bother keeping Geexbox when one can play almost all media on Windows or a full-featured Linux like Ubuntu already installed on the PC? Ever tried installing Windows XP just to watch a few movies? How about not wanting to mess around with drivers, players, codecs and recofiguring your system for easy remote control? And then putting it all back? I understand your point, but the LiveCD option is great when you don't want to touch the HDD[s], or have an old computer without HDDs.